Back in October, Poundland challenged us to have a Hallowe'en party on a £20 budget. We had a blast browsing all the goodies and frivolously filling up our shopping basket - and then we had an awesome party to boot! This month we were given another £20 voucher to spend, but this time on Christmas products. We were encouraged to interpret this in whichever way we wanted, which was quite lucky as I have already got festive decorations and crockery coming out of my ears and feared the husband might divorce me if I brought home any more. 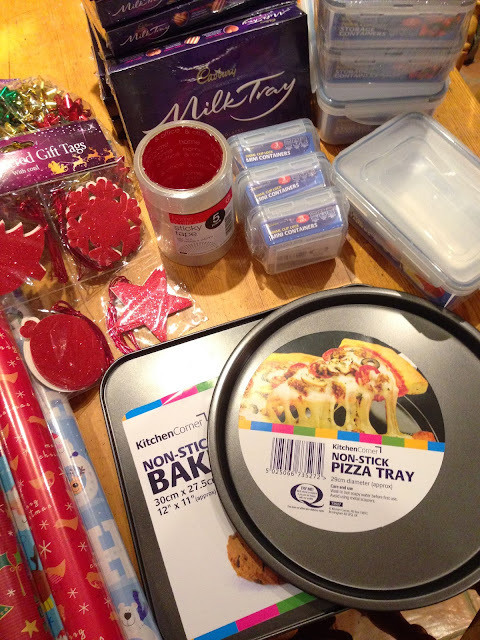 In store there was HEAPS to choose from - decorations, tablewares, sweets - but I chose to go down the unconventional route and spend my vouchers on wrapping paper, gift tags, sellotape, food storage and baking trays! Sounds a bit daft but Christmas, to me, is all about gluttony and over indulgence. The new trays were bought specifically for heating up canapes on Christmas Eve and we always have a whole lot of leftovers which I like to box up and eat after Christmas Day! The gift wrap was SUCH a bargain - either three 3m rolls for £1 or a 10m roll for £1 and the quality is fantastic for the price. I also stocked up on essential sellotape (5 rolls for £1) and thirty gift tags. Lastly I bought some chocolates as stocking fillers - Poundland is fabulous for branded food and sweet treats, as I discovered at Hallowe'en.